Live broadband streaming of the 2008 Beijing Olympics accounted for 2,200 of the estimated 3,600 total hours shown by the American NBC-Universal networks. At the 2012 London Olympics, unprecedented multi-platforming embraced online, mobile devices, game consoles and broadcast television, with the BBC providing 2,500 hours of live coverage, including every competitive event, much in high definition and some in 3D. The BBC also had 12 million requests for video on mobile phones and 9.2 million browsers on its mobile Olympics website and app. This pattern will only intensify at future sport mega events like the 2014 FIFA World Cup and 2016 Summer Olympics, both of which will take place in Brazil. Increasingly, when people talk of the screen that delivers footage of their favorite professional sport, they are describing desktop, laptop, and tablet computer screens as well as television and mobile handsets. 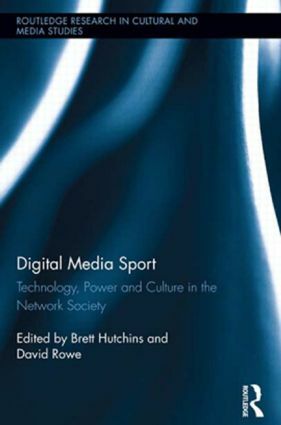 Digital Media Sport analyzes the intersecting issues of technological change, market power, and cultural practices that shape the contemporary global sports media landscape. The complexity of these related issues demands an interdisciplinary approach that is adopted here in a series of thematically-organized essays by international scholars working in media studies, Internet studies, sociology, cultural studies, and sport studies. Brett Hutchins is Associate Professor and Co-Director of the Research Unit in Media Studies at Monash University, Australia. David Rowe is Professor of Cultural Research in the Institute for Culture and Society, University of Western Sydney, Australia.